[Marklar] needed an IR receiver for a project he was working on, and his local electronics store was fresh out. He dug through his junk pile and found an old stereo receiver, so he decided to pull the IR module from it before tossing it out. Once he had it taken apart, he figured that he could utilize the wide array of electronic components he found inside, and set off to start a new project. The control panel housed the components which interested him most of all. Using an Arduino, he was able to easily interface with the rotary encoders as well as the buttons, giving him a cheap and easy way to control his home lighting system. 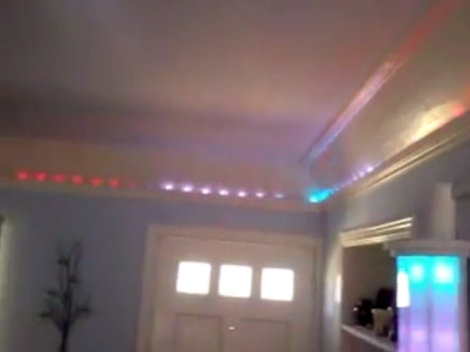 With a bit of programming, he was able to map lighting presets to various buttons, as well as use the rotary encoder to control the LEDs’ brightness and color. As an added bonus, he kept the IR receiver intact and can control his setup wirelessly as well. Check out the video we have embedded below to see his scavenged control system at work. Great idea, I love it when people think to reuse larger pieces of electronics instead of only individual components..
Have you tried to get the display working as well? I like how he’s made it unnoticeable unless it is turned on, though the wires could do with tidying. OMG, wow, if your gonna do it, do it right! that is totally wicked. Wow… I absolutely love this hack! I’ve been interested in doing some LED lighting around my house, and also interested in reusing some old scrap electronics I have (including an old receiver too!) for something. You, sir, have made my day! Just great. Nice job , maybe get the display wired up to show the preset numbers or pattern. Wowzers… nice presets, but might’ve been cooler to lose the front panel, and just control everything with the remote. Now that is a hack. I love this. Functional, looks good, hacks existing stuff to do something different/better. Thanks for all the nice feedback. I looked at the display but it was very specific and I had already learned as much as I wanted from this project so I just ripped it out. I love the IR but having the feel / click back and speed of real dials is nice. What I don’t show in the video is I also have music responsive play and the volume control sets sensitivity. The dial is so much nicer than up/down IR buttons for this type of adjustment. I love the feel of using the high quality stereo components. The wires on the back are just laying around in a breadboard. I just tossed this together and have yet to even make a box for it or hone the settings. One day I’ll have the time to create a little board and box, etc :).